Fresh from an exquisite and thoughtful remodel, this Prairie home enjoys a wealth of modern upgrades while maintaining all of its original charm. A custom oasis set atop a quiet street in Crocker Highlands, this home enjoys sunshine, privacy and expansive views of the open sky. The main floor is divided into a perfect layout, with private bedrooms on one side and public rooms on the other. The warm and inviting living room is illuminated by a classic picture window and opens to a bonus sunroom. The expansive dining room and kitchen are perfect for entertaining, with every amenity for the modern chef (Wolf stove, Carrara marble, custom cabinets) perfectly in sync with the fine details of the 1920's (original hardware, oak floors). This great room spills onto a patio with a lively fountain adjacent to a detached art studio. Three spacious rear terraces are ideal for al fresco relaxation. Each of the two upstairs bedrooms has been fully remodeled, with extraordinary built-in electric closets and drawers in the master. The brand new master bath boasts heated floors, a walk-in shower with subway tile and Grohe fixtures. The second new custom bath has Carrara marble and a deep cast iron bathtub. Downstairs opens to a flexible area with laundry facilities and abundant space for storage and a wine cellar. An additional bedroom, bathroom and kitchenette can be locked off and used as an in-law with a separate entrance. Perfectly situated five blocks from the highly-ranked Crocker Highlands Elementary School. Walking distance to the restaurants and shopping of Lakeshore, Grand and Piedmont Avenues, as well as the Grand Lake Farmers Market. Close to public transportation, casual carpool, bike lanes and major freeways. 4258 Balfour close to it all, but a world away from the bustling city. 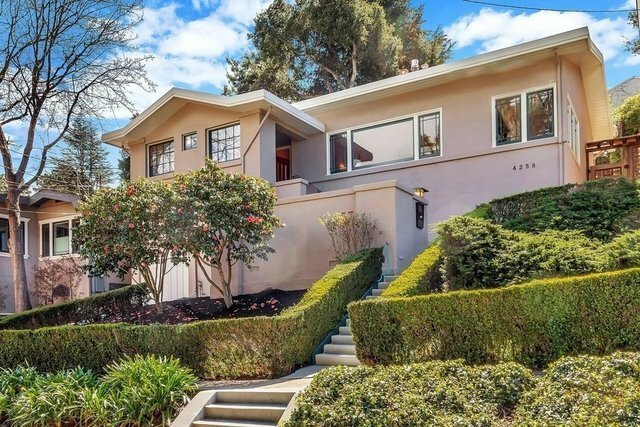 Enjoy the privacy of this coveted property in the best neighborhood in Oakland.